There was no Olympic medal this time around, but Gus Kenworthy won't be leaving Pyeongchang empty-handed. With his competitions complete, Kenworthy and his boyfriend Matt Wilkas visited the site of a Korean dog meat farm which is currently in the process of being closed down. In a social media post, Kenworthy called it a "heart-wrenching" experience. Kenworthy said that all 90 dogs that were on the farm are being taken to the U.S. and Canada for adoption, but one of those dogs has already found its fur-ever home. "I adopted the sweet baby in the first pic (we named her Beemo) and she'll be coming to the US to live with me as soon as she's through with her vaccinations in a short couple of weeks. I cannot wait to give her the best life possible!" he wrote on Instagram. In 2014, Kenworthy made headlines for his role in helping to bring several stray dogs from Sochi back to the States. 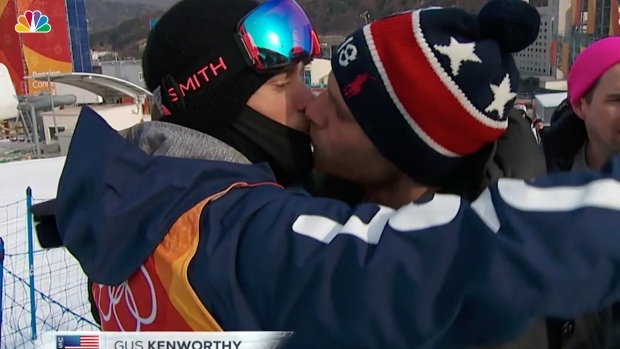 U.S. Freestyle Skier Gus Kenworthy discusses his kiss with his boyfriend that aired during NBC Olympics' coverage.